Redwood City, CA, September 26, 2018 — WorkBoard, a pioneer in Enterprise Strategy and Results Management, and Deutsche Telekom’s Detecon Group, a leading global management and technology consultancy focused on digital transformation and enterprise agility, today announced an agreement enabling Detecon consultants to help enterprise companies align, measure and execute on strategic priorities with transparency and efficiency using WorkBoard’s cutting-edge solutions. The partnership builds on Detecon’s expertise in transformation and digitalization and allows more than 1,000 Detecon management consultants around the world to help clients achieve strategic priorities quickly using WorkBoard’s platform. 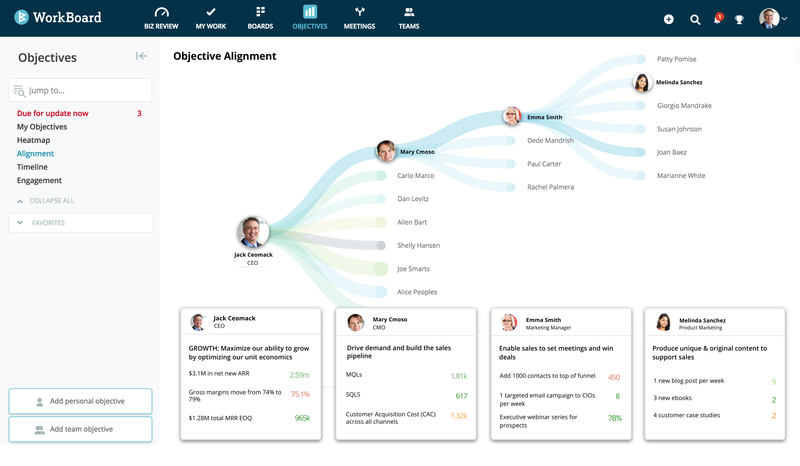 As part of the partnership, Detecon expands its practice expertise to include the implementation of the WorkBoard results management platform and OKRs (Objectives & Key Results), a popular methodology used to drive hyper growth by defining and aligning strategic priorities and ambitious success metrics on a quarterly cadence. Detecon consultants are certified through WorkBoard’s intensive OKR Coach Certification Program and have delivered more than a dozen WorkBoard implementations. The WorkBoard platform enables alignment and measurement of OKRs and strategic priorities in large enterprises because it easily accommodates deep hierarchical organizations with matrixed reporting, business units and dynamic teams, pods and squads. Its heatmap shows results progress across the business so risks to results are visible in less than a blink; digital Running Business Reviews™ replace tedious management reporting with continuous facts on progress to plan. By bringing strategic priorities together with Kanban boards, shared workstreams, and integration to popular business systems, WorkBoard closes the strategy-execution gap that slows business results. WorkBoard is the pioneer of Enterprise Strategy and Results Management solutions which help organizations to set, measure and execute strategic priorities faster. Company founders, who combined have 18 patents and two Smithsonian Innovation Awards, created a new solution category when they recognized that market and technology acceleration would require a corresponding acceleration in how companies iterate and activate strategic priorities. Both high-growth and high-scale companies use WorkBoard, including companies like Microsoft, Reliance Industries, AmTrust, Samsung, 8X8, Disys, Intellidyne, eSilicon, EDMI, TrendKite, Influitive, Go1 and others. For more information, visit www.WorkBoard.com or follow the company on Twitter @WorkBoardInc. Detecon is a leading corporate consulting company operating worldwide; for more than 40 years, it has combined classic management consulting with outstanding technological competence. The focus of its activities is on the field of digital transformation. Detecon supports companies from all areas of business as they employ state-of-the-art communication and information technology to adapt their business models and operational processes to the competitive conditions and customer requirements of a digitalized, globalized economy. Detecon’s expertise bundles the knowledge from the successful conclusion of management and ICT consulting projects in more than 160 countries. The company is a subsidiary of T-Systems International, the key account brand of Deutsche Telekom.